These products have been updated and are not longer available, but check out our other light jackets here. 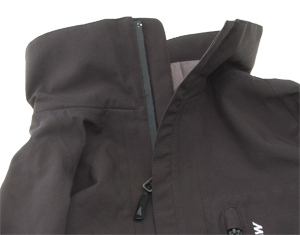 This year Musto Jackets have been vastly expanded with some new additions to their Evolution line of products. They’ve added to the shorts and pants offered last year to include a range of jackets as well as some lightweight technical shirts. Today we’re looking at the Evolution Lite Jacket, Evolution Softshell and Evolution Jacket (pictured left to right above). You can find Musto jackets pulling out all the stops with their Evolution gear series – it’s all really nice stuff made with premium fabrics. The full line includes several Polartec fleece jackets as well as these Gore-Tex hard shells. All the jackets come in a very chic black with subtle trim features – no flashy reflective patches or excessive brand logos. The Evolution Jacket is a bomber style jacket with a Gore-Tex outer shell and a thick Polartec fleece lining. It’s very Tom Cruise but cooler because it’s got Gore-Tex – I’m sure even Top Gun pilots didn’t get schwag this nice. 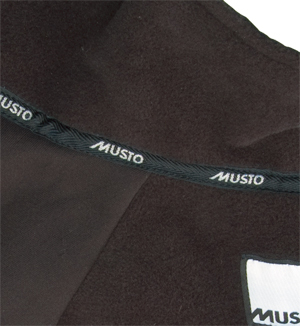 To the right is the fleece lining along with the Musto collar detailing. The more smooth faced sleeve lining is in the lower left of the picture – the facing helps keep under layers from binding as you move and it works but it doesn’t have that soft fleecy feeling which is a shame. The Evolution Lite Jacket is one of the first jackets in the marine market to use the Gore-Tex Paclite fabric. Extremely lightweight while remaining fully waterproof Paclite makes this jacket perfect protection from spring showers and summer thunderstorms. The Evolution Soft Shell is the cream of the Evolution crop – it’s made from Gore-Tex soft shell fabric and features a fuzzy backing. Musto refers to it is a flannel facing on the inside – which is a good description except that it makes me think of a heavy flannel shirt which this isn’t. Basically it looks similar to in inside of most Gore-Tex jackets but instead of being smooth it has a fuzzy, fleece like feel to it. I don’t think the jacket would be all that much warmer than traditional Gore-Tex but it feels a bit lighter and more flexible than say an MPX jacket. It’s certainly not a replacement for a mid-layer fleece piece like the Evolution Jacket might be. The Soft Shell also has some nice additional features to keep you dry. Shown at the left there’s both an exterior and interior flap at the zipper to keep out water – the outer flap is done very nicely. It covers just enough but doesn’t require velcro like a heavier jacket because the zipper is water resistant. Overall the Evolution jackets from Musto are pretty sleek stuff. They’re not your average jacket and of course they’re not found for your average jacket price either. This is good gear that carries both the Musto and Gore-Tex brands quality reputation behind it. It has a unique style in the boating world and I think that style and quality will appeal to people. Besides, black goes with everything and you know it’s so hard to find something that will coordinate well with those docksiders.